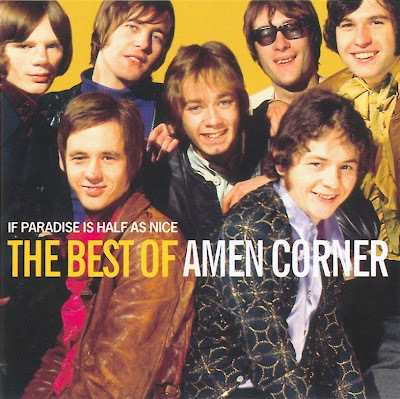 Forming in Cardiff in 1967 Amen Corner enjoyed a hit with the slow, bluesy Gin House Blues the following year. They employed a brass section which gave them a different sound from most of their contemporary beat groups. They also had a distinctive vocalist in Andy Fairweather-Low. A string of hits followed of which Bend Me, Shape Me (recorded by The American Breed in the US), High In The Sky and (If Paradise Is) Half As Nice were the most memorable. By the time of the last one, they'd switched to Andrew Oldham's new Immediate label. When the label collapsed in 1969 the group splintered with the brass section forming Judas Jump and the remainder becoming Fairweather. Andy Fairweather-Low later had a patchy solo career and Blue Weaver became a sessionman for a number of acts including The Strawbs and Mott The Hoople.